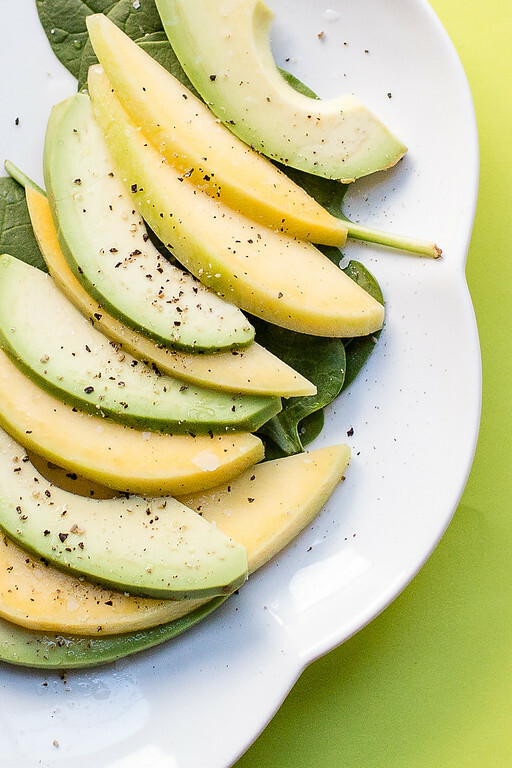 This simple salad of sliced mangoes and avocado is ridiculously easy, but absolutely perfect! Sweet mangoes, creamy avocado, tart lime juice and plenty of fresh ground black pepper create a salad that is vegan, gluten free, paleo and absolutely delicious! Are you looking for a simple, healthy side dish salad? Well, you have come to the right place. I am all about simple and healthy. Don’t be fooled by how simple this recipe is, it’s so good! People will ask you what you did. How did you make it. You will not believe how just a few simple ingredients, tossed together in just a few minutes can make something so delicious! Lettuce leaves – primarily for presentation, though we usually eat them too. Avocado – you want an avocado that’s a little more firm so that you can neatly and thinly slice it. Mango – find a slightly firm mango if you can. This salad is so easy to make! Place the lettuce leaves on four plates. Peel and pit a firm avocado and thinly slice. Peel and thinly slice a firm mango. Thinly slice a red onion or use Quick Pickled Red Onions. Place the mango slices, avocado slices, and onion slices on top of the lettuce, alternating them. Cut a lime into quarters and squeeze a wedge over each salad. Sprinkle with salt and fresh ground black pepper. I found this in So Easy: Luscious, Healthy Recipes for Every Meal of the Week . This is what it’s all about, fresh eating made so simple. This was fantastic. Who knew that all you had to do with mango and avocado was slice them, squeeze a little lime on top, salt and pepper and you had one of the best salads you’d ever eaten! Don't let the simplicity of this salad fool you, everyone loves it! Place the lettuce on each serving plate. Arrange 4 to 5 slices each of avocado and mango, alternating them in a row, onto each lettuce cup. Top each with a few onion rounds and then squeeze a lime wedge over each salad. Season with salt and pepper and serve. Arrange 4 to 5 slices each of avocado and mango, alternating them in a row, onto each lettuce cup. Top each with a few onion rounds and then squeeze a lime wedge over each salad. Lettuce leaves - primarily for presentation, though we usually eat them too. Avocado - you want an avocado that's a little more firm so that you can neatly and thinly slice it. Mango - find a slightly firm mango if you can. This post was originally published in 2014 and has been updated for 2019. Such a refreshing combo! Can’t wait to try it! 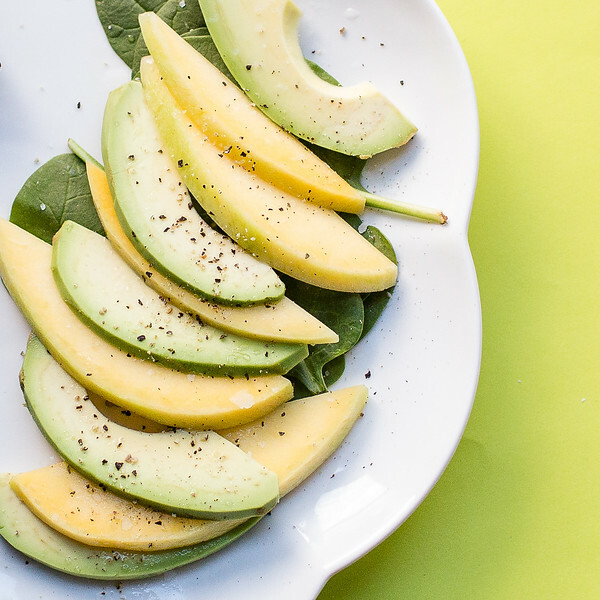 Avocado and mango are a match made in heaven! I love the simplicity of this recipe so much, the flavors just blend together so well for a little taste sensation that is out of this world. So simple, yet so perfect! HA – I always have a list, and usually come home with more. especially at a place like Marshalls. avocado and mango pair so well together – sometimes it is the simple things. yum. Pam, I love the simplicity of the dressing over the beautiful pairing of avocadoes and mango. Can’t wait to try it! Have a great weekend. So simple and yet so good! I love meals/salads like that. I think I have that book, I need to take another look. Salad is lovely.